Liquid Story Binder XE 2.91 was available as a giveaway on July 18, 2008! Updated using Ryan's (#14) tip. Black Obelisk updated my version from 2.91 to 3.11! What a pleasant surprise. I've written one novel and working on my 2nd, and looking forward to checking this software out. Thx GAOTD and Black Obelisk! But then ,all of this to a word processor ?? by see what it does when finished what you made then you go nowhere ..
solid final file presentation exact with what you made? Only then it will be something ,else its nothing . At first sight : wwwooww amazing ,perfect .... But then ,all of this to a word processor ?? by see what it does when finished what you made then you go nowhere .. It does not compile something like a .exe file that runs a book or a solid final file presentation exact with what you made? Only then it will be something ,else its nothing . I just love this! I am writing a book and a friend told me about the give away of the day. I am so grateful to have finally found something like this to help me keep my thoughts and writings in order. 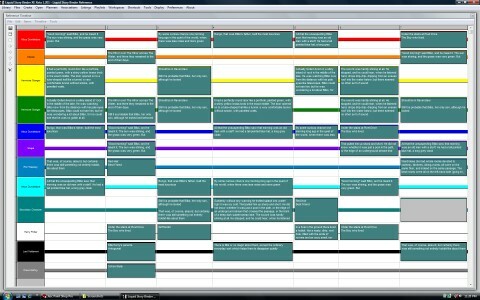 I use the builder and story board quite a bit so that I can lay out my thoughts and see them visually. Just amazing. Love it! My book will have over 30 chapters, and I need to have a solid book proposal for the publishers and let me tell ya, this program has saved me so much time and helped me put together an excellent proposal. Can't believe I missed this giveaway. I'm a budding writer, so this program would be great. Any chance of re-publishing it on GAotD in the near future? GAOTD, bravo! This is the type of stuff that I'd like to see here! I have been an aspiring writer, and this is just the thing!! Thank you so very much for this product! Definitely one I'll buy to replace if I lose my GAOTD version. Aw man, I missed it. It looked like a fantastic program too. This is a great website, though, offering programs like this for free. Maybe I'll be lucky enough to catch it next time around if they offer it. Looks like a great writing program, just got to figure out all the options, keeper! Wow, this is really a powerful program. It looks to me like the sky is the limit when considering what this baby can do. GAOTD you've hit this one out of the park. Thanks. Wow, this is really a powerful program. It looks to me like the sky is the limit when considering what this baby can do. GAOTD you've hit this one out of the park. Thanks. It is one of the best programs you have offered so far in my opinion much more helpful than the rest to me it is as user friendly as a program you can get and it's very self explanatory with examples as well as easy to understand directions on its usage and functions. I am still confused about this word processor. So once I created a book out of it, does that mean I can save the entire book into a pdf document or word document? I am just curious as to how one can export the document into paper print. Sorry if my question sounds silly. I cannot seem to find any direct answers from the website. Or, does it means this software only allows you to create and view the book from this software. Thank clarification on this matter would be appreciated. Thanks. I am still confused about this word processor. So once I created a book out of it, does that mean I can save the entire book into a pdf document or word document? I am just curious as to how one can export the document into paper print. Sorry if my question sounds silly. I cannot seem to find any direct answers from the website. Or, does it means this software only allows you to create and view the book from this software. Thank clarification on this matter would be appreciated. Thanks. The installation was easy with a previous version. It just went seamlessly over it. Plus the old key worked too! The installation was easy with a previous version. It just went seamlessly over it. Plus the old key worked too! I love LSB. I've used it extensively for both short stories and longer pieces. It's a great way to organize all my thoughts and have them handy when I need them. In the past I had hundreds of pages of notes, outlines, character backgrounds, and even maps floating around. This program takes all of that and puts it in one handy package, and will even compile my manuscript for me when I'm done. The best feature of this program, however, is one I've discovered completely by accident when my then-two-year-old managed to close the program without saving my work. If you look in the drafts of your chapters, LSB keeps copies of your work, even when you tell it you don't want to save, and dates each one. So if you work on something and don't want it saved, what that really means is it won't save to your main file, but there's a copy on hand just in case. Those who take their writing seriously will appreciate the spare copies of previous drafts without having to juggle multiple files in another program. I can't tell you how many times this program saved me the agony I used to feel at writing a scene, changing it later, and then regretting it. I would recommend this program for anyone, even someone who doesn't write seriously, because of the power behind this program. I'd even use it to draft parts of a resume, so that you'll have all your past revisions on hand in the program's built-in archives. I love LSB. I've used it extensively for both short stories and longer pieces. It's a great way to organize all my thoughts and have them handy when I need them. In the past I had hundreds of pages of notes, outlines, character backgrounds, and even maps floating around. This program takes all of that and puts it in one handy package, and will even compile my manuscript for me when I'm done. The best feature of this program, however, is one I've discovered completely by accident when my then-two-year-old managed to close the program without saving my work. If you look in the drafts of your chapters, LSB keeps copies of your work, even when you tell it you don't want to save, and dates each one. So if you work on something and don't want it saved, what that really means is it won't save to your main file, but there's a copy on hand just in case. Those who take their writing seriously will appreciate the spare copies of previous drafts without having to juggle multiple files in another program. I can't tell you how many times this program saved me the agony I used to feel at writing a scene, changing it later, and then regretting it. I would recommend this program for anyone, even someone who doesn't write seriously, because of the power behind this program. I'd even use it to draft parts of a resume, so that you'll have all your past revisions on hand in the program's built-in archives. This looks fantastic...I have been seeking a new editor to create my Ebooks again, as the old one is no longer reliable..
"AND THE DEVIL GETS A LOT OF THINGS DONE TOO!!" To those who all smell a 'DEVIL' in this great work: "AND THE DEVIL GETS A LOT OF THINGS DONE TOO!!" Since #15 and #18 mentioned screenplays, I'll share my recommendation that anyone interested in writing screenplays take a look at Celtx. Since #15 and #18 mentioned screenplays, I'll share my recommendation that anyone interested in writing screenplays take a look at <a href="http://www.celtx.com/" rel="nofollow">Celtx</a>. Most publishers require manuscripts to be submitted in MSWord. Does this software have an export to MSword funcion? I can't find it. This is a great program. I downloaded the newer version from the software's website and used todays register code from GAOTD's download file and it works great. What will be even more useful is being able to install to both my desk top computer and also install onto a flash stick to carry on the go to run off a laptop or at someone else's computer for collaboration projects I do with co-writers. Thanks GAOTD and Black Obelisk for letting us try this program out. This is a great program. I downloaded the newer version from the software's website and used todays register code from GAOTD's download file and it works great. What will be even more useful is being able to install to both my desk top computer and also install onto a flash stick to carry on the go to run off a laptop or at someone else's computer for collaboration projects I do with co-writers. Thanks GAOTD and Black Obelisk for letting us try this program out. Wow, GAOTD--you knocked my socks off with this one. I have found a lot of useful aps through your website but this one is hands down the best ever. After I installed this one, I went directly to the website for the update==it too installed with no problems. It is very intriguing and I am enjoying discovering its many fine qualities. I also installed it on my son's computer since he is away in China right now because I know he will love this one, especially with all the alternate dictionaries available. Note, though, when I installed the dictionaries, the menu choices switched to that language but Jesse Wall at Black Obelisk Software responded very quickly with a solution so I could switch it back to English. Hurrah for GAOTD and Jesse!! Not a bad program, but not user friendly. As many have said this will obviously have a learning curve. Worth a DL if only to check it out because it's a very small download. I also think it's worth noting that a program like this will not make you write any better, so don't get your hopes up. New versions of Liquid Story Binder XE can be installed directly over older, existing versions of Liquid Story Binder XE. There is no need to uninstall the previous XE version. yep...it installs over the earlier one easily...8) from the website... Installing New Versions Over Old... New versions of Liquid Story Binder XE can be installed directly over older, existing versions of Liquid Story Binder XE. There is no need to uninstall the previous XE version. #49 JohnFredC - "So I would never use this software simply because there is no way to automatically dock related windows without a LOT of mouse dragging and resizing…" - Sure there is. OK, so do you have to drag and resize the first time, but then you save it as a workspace with a "friendly" or descriptive name you can easily remember. And you can save as many workspaces as you want or need. The beauty of the program is that you can use as many or as few of the features as you want. If you want a simple setup, you can do that. If you want a complex setup, you can do that, too. Start small, with the basics, then add things as you get more comfortable and adventurous. I really want to thank you for this great software! For the longest time I wanted to write my biography and now I'll be able to do it much easier. Also my son has a book written in longhand and really needed something like this. You have made his dream come true. Thanks for your help! Thanks so much for the great software! My son is going to love it. He has a neat book he wants to write, right now it's all in long hand! And, for myself... well, I've wanted to write a few things myself. This is just what was needed. I downloaded this one the first time it was offered and I can say, I've been waiting for this software since I started writing. I write Science Fiction & Fantasy and have huge world creations, and I could never seem to keep the material organized, from the way dates interact throughout my inhabited worlds, to background information on long stretches of time and cultural changes, to my characters themselves. This is the first time I hit a software that works the way I think--building universes, not just small one-time stories. And it's also the least expensive on the block when it's not free! I downloaded this one the first time it was offered and I can say, I've been waiting for this software since I started writing. I write Science Fiction &amp; Fantasy and have huge world creations, and I could never seem to keep the material organized, from the way dates interact throughout my inhabited worlds, to background information on long stretches of time and cultural changes, to my characters themselves. This is the first time I hit a software that works the way I think--building universes, not just small one-time stories. And it's also the least expensive on the block when it's not free! Thanks for that - I went through the registration dialogue several times (and did the update to 2.92 but for some reason always hit [Finished] after pasting reg-code and when I went back and saw it was still blank thought that was just the way this program handled it. Finally realized you have to click [Enter Registration Information] NOT click [Finished]. Would have been an unpleasant surprise if I actually used it on 30 different days and only THEN discovered I'd never registration. I've already installed this on both my computers - I'd like to see if just copying my program folder to another computer would work tomorrow and/or if the registration code is actually unlimited and work on other computers tomorrow? #106 Ryan &gt;If you want to check and make sure that version 2.92 is registered, go to the “About” menu and click “Register Software”. If it is registered for the unlimited version, the registration code should be filled in. Click “Enter Registration Information” to close the window. If it is not registered, simply go back to readme.txt and enter the registration code from there. If the registration code was incorrect and it wants to be a trial, it will display an error message like “Incorrect Registration Code”. Good luck! :) Thanks again GAOTD and Black Obelisk Software!&lt; Thanks for that - I went through the registration dialogue several times (and did the update to 2.92 but for some reason always hit [Finished] after pasting reg-code and when I went back and saw it was still blank thought that was just the way this program handled it. Finally realized you have to click [Enter Registration Information] NOT click [Finished]. Would have been an unpleasant surprise if I actually used it on 30 different days and only THEN discovered I'd never registration. However, based on comments about program author and feedback I've seen on the Yahoo group I wouldn't be surprised if he gave me a pass and let me re-register then :-) I've already installed this on both my computers - I'd like to see if just copying my program folder to another computer would work tomorrow and/or if the registration code is actually unlimited and work on other computers tomorrow? Your protection software on your computers will react in different ways to this software. Some may say virus or trtojan. Not that it matters since I'm a hobo and don't have a computer of my own. I use it at the library. Excuse me while I go out and panhandle for some booze. #59 Sheree and #80 seth - Tell your Mac user to explore Parallels and VMWare Fusion, which allow using Windows software on an Intel Mac. Some Windows software works better on Parallels, some works better on VMWare -- just a matter of trying them both and going with the one that works best for what you're trying to run. Thank you Black Obelisk Software and GAOTD for today's program offer -the dsl download/setup and registration took about 3 minutes total to complete. While I am not a 'published' writer, this program does have other options = family history, poems, journaling, ect ... I agree that the program will take some time to learn, this statement can be said about most software program's today. Also, I saw no 'devil' pics on their site, but each person does have their own opinion of what they consider as an 'evil' picture. Glad I didn't miss this offer! Thank you Black Obelisk Software and GAOTD for today's program offer -the dsl download/setup and registration took about 3 minutes total to complete. While I am not a 'published' writer, this program does have other options = family history, poems, journaling, ect ... I agree that the program will take some time to learn, this statement can be said about most software program's today. Also, I saw no 'devil' pics on their site, but each person does have their own opinion of what they consider as an 'evil' picture. Glad I didn't miss this offer! Well, considering my own meager writing skills this software is quite advanced for me. That is to say I am beyond impressed by all the incredible tools and features this software has. What an incredible find! I am encouraged to jump in and sort out the "Jungle" I've written across my hard drives. I just downloaded the program and it says it's a free trial and want me to uninstall my Nero 6 I can't do that. Any solution? Thanks. totally confused.....how do I register it???? Liquid Story Binder XE is a portable app, BUT ONLY if you install it to a portable device, like a USB stick. If you install it on your hard drive, or if you copy the folder from your USB stick to your hard drive & run it, the program will install 2 folders in XP’s Documents and Settings folder... one folder has 49 files, 7 folders - the other contains 49 files, 21 folders. This is regardless editing any ini files in the program’s folder. Long story short, if you want to use it as a portable app, best to install it on a portable device (USB stick etc) & then if desired, copy the installed program folder to your hard drive as well. The program does appear to open some Window’s processes or apps that stay running - testing for portability, I couldn’t delete files once the program was run (and stopped) until I restarted Windows. Whatever it is it wasn’t detected in Task Mgr. I can see some anti-virus software complaining about that, & it might explain earlier comments about a suspected trojan. Liquid Story Binder XE is a portable app, BUT ONLY if you install it to a portable device, like a USB stick. If you install it on your hard drive, or if you copy the folder from your USB stick to your hard drive &amp; run it, the program will install 2 folders in XP’s Documents and Settings folder... one folder has 49 files, 7 folders - the other contains 49 files, 21 folders. This is regardless editing any ini files in the program’s folder. Long story short, if you want to use it as a portable app, best to install it on a portable device (USB stick etc) &amp; then if desired, copy the installed program folder to your hard drive as well. The program does appear to open some Window’s processes or apps that stay running - testing for portability, I couldn’t delete files once the program was run (and stopped) until I restarted Windows. Whatever it is it wasn’t detected in Task Mgr. I can see some anti-virus software complaining about that, &amp; it might explain earlier comments about a suspected trojan. New versions of Liquid Story Binder XE can be installed directly over older, existing versions of Liquid Story Binder XE. There is no need to uninstall the previous XE version. As with any new installation, always make sure to backup your work before proceeding!!" Thanks again GAOTD and Black Obelisk Software! I love this software. I've been using the trial program for a few weeks on both XP machines and Vista and it rocks. I keep discovering new and fun things it can do. I often write multiple stories and books at the same time and this really helps keep everything organized. A friend of mine uses it for poetry and another friend (who recommended) it to me uses it just for journaling. It's very cool and highly adaptable. Thank you black obelisk and gaotd! I love this software. I've been using the trial program for a few weeks on both XP machines and Vista and it rocks. I keep discovering new and fun things it can do. I often write multiple stories and books at the same time and this really helps keep everything organized. A friend of mine uses it for poetry and another friend (who recommended) it to me uses it just for journaling. It's very cool and highly adaptable. Thank you black obelisk and gaotd! On a different note: I went to About > Register software, entered the serial number (Had to type it manually. Why can't I do a copy-and-paste? ), clicked ENTER REGISTRATION INFORMATION, and got the Thank-you-for-registering dialog, but it didn't send me to the website or anything. I'm fine, right? It won't expire on me after 30 days, right? In reference to post #47 and such.... Haven't seen "2001: A Space Odyssey" have you? The concept of a big, black obelisk (well, monolith, actually) was rather prominent in that film, and it wasn't part of any kind of temple worship. :D And anyway, I seriously doubt people are going to start worshiping deities from some long dead religion just because they've bought software from a company naming itself after an ancient type of stone structure. :P On a different note: I went to About &gt; Register software, entered the serial number (Had to type it manually. Why can't I do a copy-and-paste? ), clicked ENTER REGISTRATION INFORMATION, and got the Thank-you-for-registering dialog, but it didn't send me to the website or anything. I'm fine, right? It won't expire on me after 30 days, right? Very nice piece of work. Obviously geared toward the fiction writer, esp. in the sense that it is like composing paper. Neither the technology nor the formatting get in the way. You can even customize the hot keys, color schemes, etc. I can see where this would help with all aspects of story craft, that is the research, the plotting, characterization, as well as the writing. It is also small and installable on a usb drive. This would probably work for anybody building a manuscript where you aren't actually trying to format for publication. I just scanned my computer using Spyware Doctor and then with Zone Alarm. There were no Trojans or anything else. The link he gave went straight to the site for LSB 2.9. I'm not getting where you picked up a Trojan. I downloaded this to my laptop and liked it so much that I got my husband to download it to our family desktop too. We had a problem installing at first because Net Nanny was blocking it. Once we figured that out it was a breeze. My daughter, who plans on writing the Great American Novel, is really excited about using this tool. I downloaded this to my laptop and liked it so much that I got my husband to download it to our family desktop too. We had a problem installing at first because Net Nanny was blocking it. Once we figured that out it was a breeze. My daughter, who plans on writing the Great American Novel, is really excited about using this tool. Martijn (85) is right, the download he posted a link to has no trojan. Cool! very cool! this will go along way to helping map out with my stories. Tried the demo, always wished i had the full version to expand those creative juices and now i can. Thankyou. Can someone 'Official' please verify that the downloading of Version 2.92 (from the software-designer's site) and entry of the registration code (in Readme file from today's offer) will work indefinitely --- and not just for 30 days ? To add to previous requests for this: Can someone 'Official' please verify that the downloading of Version 2.92 (from the software-designer's site) and entry of the registration code (in Readme file from today's offer) will work indefinitely --- and not just for 30 days ? Thank you! I keep getting the same message... 'activation module failed to connect to gaotd.' Any idea how I can make this work? I keep getting the same message... 'activation module failed to connect to gaotd.' Any idea how I can make this work? Thanks. Thanks GAOTD and Black Obelisk for this program. (And btw, I must be looking at the wrong website because I saw nothing demonic. I saw fantasy pictures with elves, and winged horses, etc.) Anyway, I too am published and in the middle of two books, notes all over the place. This is just so perfect if for nothing else just to organize everything. Being fairly new to computing I have had no idea for a very long time (except for Evernote) what the software was about. So glad to find something I not only know what it is but it is something I have really been needing. Also, I downloaded the way #30 suggested and had no problems with Trojans or anything else. If it did, wouldn't that be coming from the website? This program can be very simple or complicated, depending on how adventurous you are. And that's the great thing, because once you know what's available, it adapts to your working style, not the other way around as with most writing software. This is a great software for writers! If there is a rating system available here, I would give it the maximum stars available in all categories. The best thing about this is that the software author is very responsive to feedback and suggestions. The support group for this program: http://tech.groups.yahoo.com/group/Liquid_Story/ This program can be very simple or complicated, depending on how adventurous you are. And that's the great thing, because once you know what's available, it adapts to your working style, not the other way around as with most writing software. #75 - Since nobody responded, I'll respond to myself. The Black Obelisk web site says you don't have to uninstall older versions for the 2.92 download. Unfortunately, that was NOT my experience (Vista Home Premium). Trying to lay 2.92 over 1.71 resulted in many complaints from the Windows Installer, even though I was running it as Administrator. I elected NOT to try to override the problem spots and gave up. After cleanly removing 1.71 with Revo Uninstaller, version 2.92 went in smoothly and accepted the Registration Key from the 2.91 package on GAOTD. #75 - Since nobody responded, I'll respond to myself. The Black Obelisk web site says you don't have to uninstall older versions for the 2.92 download. Unfortunately, that was NOT my experience (Vista Home Premium). Trying to lay 2.92 over 1.71 resulted in many complaints from the Windows Installer, even though I was running it as Administrator. I elected NOT to try to override the problem spots and gave up. After cleanly removing 1.71 with Revo Uninstaller, version 2.92 went in smoothly and accepted the Registration Key from the 2.91 package on GAOTD. Just lately I've been downloading alot of programs from GOTD. You guys are clogging up my hard drive! Seriously, this program is wonderful. Thanks for the great offerings lately.